Once upon a time, a water bearer had two large water pots, each hanging on one end of a pole. He carried that pole across the back of his neck. One of those pots had a crack in it. The perfect pot always delivered a full portion of water, but the cracked pot could carry only half portion. This went on every day for many days. As the days went by, the perfect pot was proud about its accomplishments and started to make fun of the cracked pot. The cracked pot was ashamed of its imperfection and was sad that it could only accomplish half of what it had been made for. The water bearer noticed the sadness in the cracked water pot. He asked, "Why are you so dull these days? ", to that cracked water pot. "I am ashamed of myself. I wan to apologize to you. ", replied the cracked water pot. "Why?" asked the water bearer. The cracked pot told him about how bad he felt about his flaws and not being able to completely accomplish what he wanted to do. The water bearer, felt very sorry for the cracked pot. He said to the cracked pot, "Did you notice flowers on only one side of the path to my master's house? You have been watering those plants every day. I knew about the cracks in you, and thats why I had planted flowers only on your side of the path". 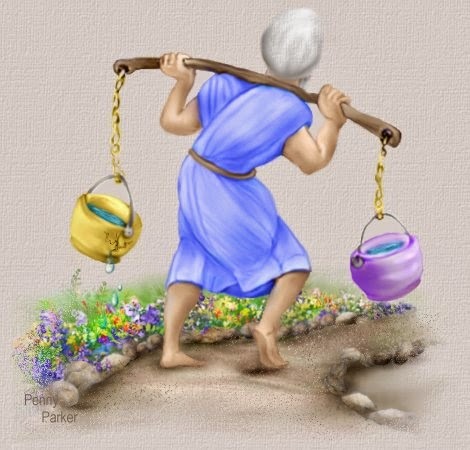 The water bearer continued, "even though you were imperfect, you did help those plants to grow healthily. Please don't worry about those cracks. Feel proud about what you have done." The cracked water pot, was now very happy about the cracks it had. MORAL : Each of us has our own unique flaws. Everyone is a winner in his/her own ways.